Mary and Matthew film chamber 2 of pocket MMP21-06 shortly after it was opened. We opened pocket 21 on Thursday and spent all of Friday, the 15th of September, working the front. By late that day we had managed to squirm to the back of it's now 1 meter length. Here we could detect a number of small openings going off in nearly all directions. In the roof there were several long vertical tubes large enough to insert your hand. In these we could feel loose crystals and crystals attached to the walls. The ones that we could tease out were smoky quartz each with a ring or coating of rose quartz crystals. 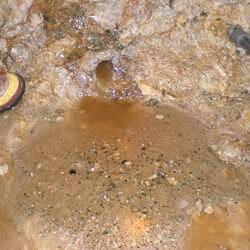 Numerous 5 gallon pockets of pocket material were screened that day yielding many gemmy green tourmlaines to 2-3cm and dozens of small rose quartz specimens. The weekend gave us an opportunity to digest our find and place it into perspective with the other pockets we had found in our 3+ years working at Mount Mica. This one wasn't bad at all. Since it was a rose quartz crystal bearing pocket, I felt I should share our find with a few researchers within the pegmatology community. All showed interest . Dr George Rossman of Cal Tech, Pasadena, responded writing that what we had most probably found was 'pink' quartz as opposed to 'rose' quartz. 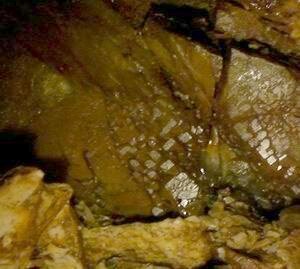 Rose is the massive variety and exhibits a rose color due to fibrous like dumortierite inclusions. 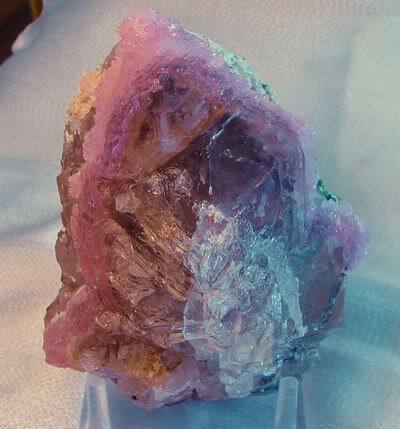 Pink quartz is crystalline and involves a phosphorous aluminum substitution and radiation. Dr David London, University of Colorado, offered a similar observation. 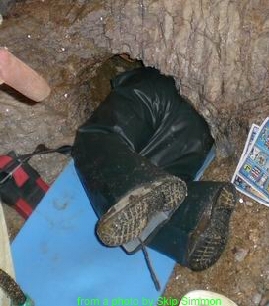 Dr Skip Simmons, UNO, felt the find was of sufficient merit to be on hand to observe and document the find before it was further disturbed. On Monday the 18 we resumed working the pocket. Since the blast we had focused our attention on the chamber we had first opened. Monday we decided to take a careful look under the area to the right of the pocket that had been buried in the muck generated by the blast. 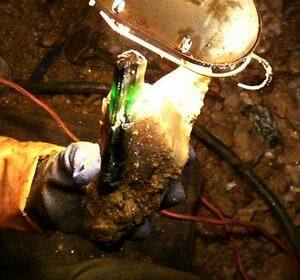 All of the muck had to be carefully examined as it was being cleared to make sure none of the pocket contents was in it or possibly the contents of a nearby smaller chamber that had been completely blasted out. 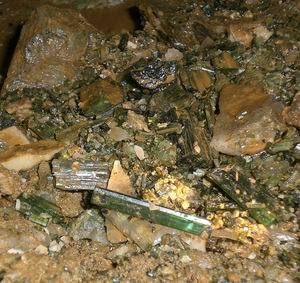 Though we did not find any pocket material in the rubble as we got down to the floor we began to uncover numerous small cavities and crevices. Each of these had a few small tourmalines and quartz crystals. 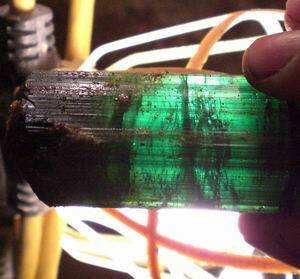 Richard and Missy opened a small space in the back wall that contained a 8 cm tourmaline broken into 3 pieces. One end was completely encrusted with pink quartz crystals. 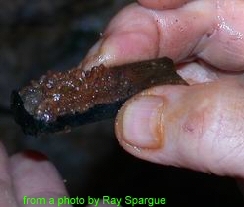 Another cavity contained a small bluish tourmaline. 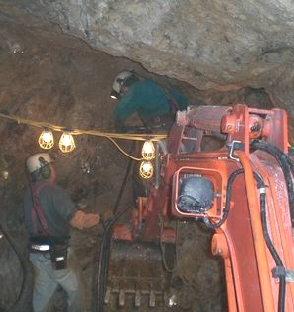 Once we had satisfied ourselves that nothing major was blown out we returned to working Friday's cavity. Mary had come up to Maine over the weekend bringing our daughter Cathy and a young man, Matthew Bedard, from our work in Florida. Cathy and Matthew are the company's video production crew. Thier assignment at Mount Mica was to catch as much as possible of this find on video. As described in other updates on this site, Mary works pockets aggressively and completely. She lost no time with this one. 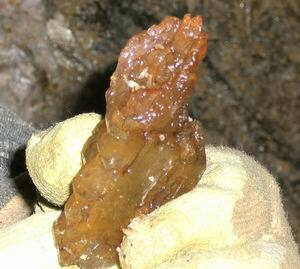 On Friday we had left large quantities of pocket dirt with tourmaline banked up on either side of the cavity. Mary had to first remove this material to explore the back of the pocket. A quartz hood seemed to block the way to another space. 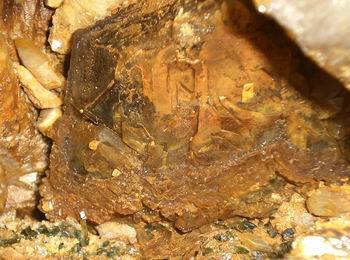 Chipping a small amount of this quartz away revealed a space containing some large tourmalines. As the space was further worked we could see it was swinging around to the right . This prompted us to do some exploratory drill holes along the back wall of our advance. The firs t hole we drilled intercepted a space less than a foot into the wall. Moving over to the right, we again intercepted a space. Finally, we drilled another hole yet furhter right but as low to the floor as we could manage. 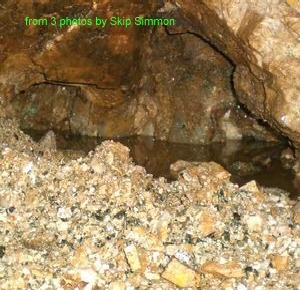 This hole too went into a space and gushed water carrying tourmalines which formed a small dune in front of the hole. In order to get a better idea as to the nature of this spaces or spaces we inserted our water hose into the highest hole. It ingested many gallons of water before the water began to drain from the holes we had drilled. This hinted at a couple of things. The space(s) were large and they were not connected along their bottoms but seemed to be connected more towards the top. This implied there may be more than one chamber involved. Fortunately our blasting that opened up the first chamber had left us with a narrow shelf along the back of the cut. We decided to drill two short vertical holes into this shelf to see if we could open these new spaces. Unfortunately it took more than 4 attempts as each hole went in to the pocket. We need a complete hole in order to do the tiny blast we planned. Finally we had our hole. As it was late in the day we decided to postpone the shot until the next morning Tuesday the 19th. Our fingers were crossed that with this one, unlike the shot that originally opened this pocket system, we would do no damage... the Hippocratic Oath of Gem Miners. The next morning, using only 1/4 of a stick of dynamite, our mini-blast peeled off enough feldspar and quartz to allow us to see in. Large quartz crystals with pink quartz rims and some tourmaline were immediately visible. 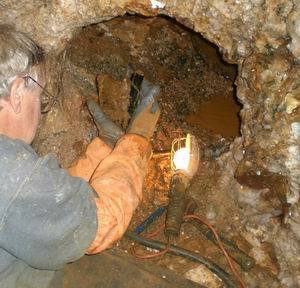 It was clear now that the first exploratory hole had gone into a chamber different from the one we w ere now working. 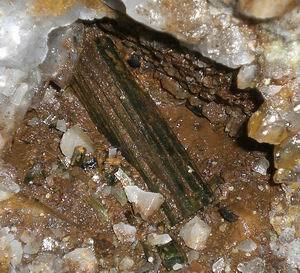 On the upper left of this chamber there was a narrow tourmaline filled tube that went off to the left. So there was more to explore, but the best of this chamber, number 2, was yet to come. 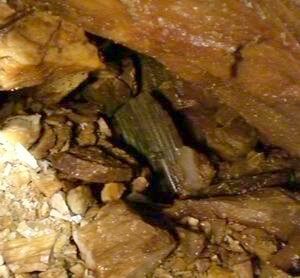 At the back a smoky quartz crystal was firmly locked into the pocket wall. I spent a couple of hours drilling a ring of small holes around the piece in hopes of dislodging undamaged but to no avail. 2 days later Mary turned her attention to the task and after meticulous and delicate work, the piece, now dubbed the 'Angelfish', dropped into her hands. By this point we had pretty much cleaned out the 2nd chamber. Now we turned to trying to find the 3rd.